The packaging of this menopause medication has been taken to a new level. Created in a circular format with a unique marked holder for each day’s capsule, Activella makes remembering to take medication quite simple. Accompanying its unique packaging design is its benefits of reducing hot flashes, vaginal discomforts and reducing the chances of osteoporosis. 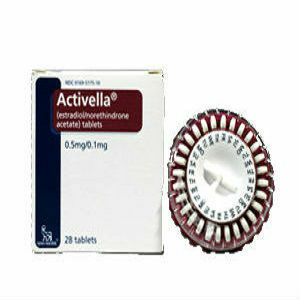 However, is Activella truly the best answer for women during this time? To answer this question, let us take a closer look at its mechanics. According to researched information, users of Activella should take 1 tablet daily. It is also recommended that each tablet be taken at the same time every day. There is no information indicating if tablets should be consumed with a meal. There is no price listed for this particular medication as it is prescription only. Price per customer will vary due to pharmacy and individual coverage. No guarantee covers Activella, a commonality for prescription medication. After reviewing information regarding Activella, several elements have arisen which should be of concern to those considering this product. The first element of concern is the benefits. While Activella does help to relieve hot flashes and vaginal discomfort, there are many other symptoms which Activella may not be able to relieve such as mood swings and fatigue. Because Activella does not provide complete relief, many symptoms will go untouched thus leaving many women with remaining discomforts that could inhibit normal activity. A second concern of using Activella is the rather long list of side effects. Many of these side effects could be quite detrimental and definitely puts women at a risk of obtaining symptoms much worse than those for which Activella is being taken. Jackie Horowitz	reviewed Activella	on July 19th	 and gave it a rating of 2.